About | What's not to like? My name is Tricia Elisara, and I am passionate about childrens’ gardens, especially the ones you find at schools. I am one of the leaders of my kids’ school garden, and you can find me there most days of the week. 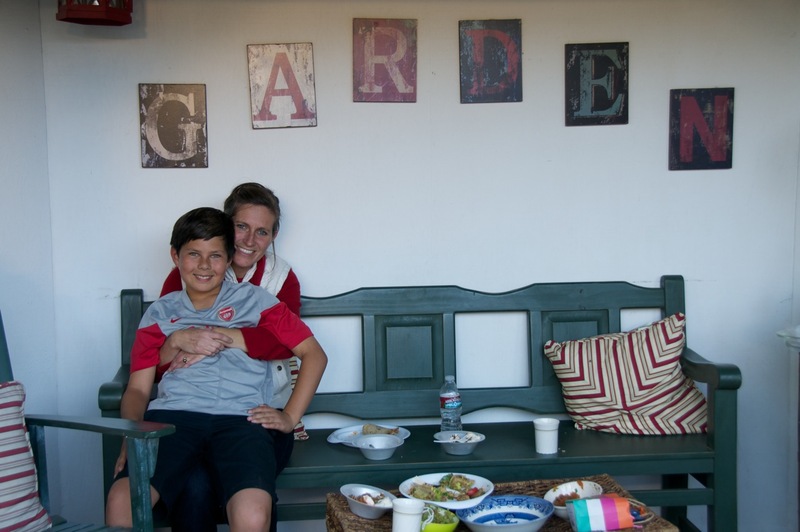 Even though our garden is at a small, rural, public school, we seek to be connected to regional, national—even global—issues as we explore all that outdoor classrooms and beckoning garden spaces can do. To write reflectively on the many topics that school gardens raise, from the power of parents to add value to their neighborhood schools to the need for children to have garden literacies and firsthand outdoor experiences in an increasingly technological age. I might talk about water-wise plants…..or heirloom vegetables….or the ways gardens can build community…..or the intersection of character development and garden tending…..or mentorship…..or advancing the common good by investing in shared spaces. Who knows? It could be big stuff (like using creativity to reimagine spaces, bringing dead things to life). Or it could be small (like a simple hummus recipe with fresh herbs that I recently taught in a parenting class.) In short, the garden as both reality and metaphor often touch on things I care about deeply. A final word. Although I am drawing heavily on stories from our school garden, this blog is not in any way officially linked with the school. (You won’t see me calling for volunteers for next week’s work party or posting a calendar of events.) Rather I am approaching school gardens topically, making a case for them from every angle I can think of. Welcome! I’m glad you’re here! Please leave comments, ask questions, subscribe and point me to good, relevant information/stories/resources. If you subscribe by e-mail, you can expect 1-2 posts a week. I faithfully respond to (and enjoy) every comment. P.S. A note on my photo masthead. Though you can’t see anything green growing, this photo was taken in our school garden. The chain link fence definitely says school. But the “bubbly dome” you see is the top piece of a mosaic sculpture that sits in the butterfly habitat. My youngest son is peeking out from behind, reminding us that gardens can interrupt the status quo with wonder and possibility. Thank you Tricia for the shout out. The farmer was here today and I shared your post with him, he loved it. What a difference in the strawberries. How exciting he was able to get this feedback! Thanks! On Friday I’ll be posting about what we did with the Be Wise zucchini—another great story. Thank you for reading. I too love this surge of interest in campus-based gardens, and I’m doing my darndest to promote them through this blog and elsewhere. Your blog is really lovely too—spent lots of time on it this week. thanks for visiting my blog today! Yours looks great! I’m looking forwarding to following you! Thanks for the tip on the D.C. children’s garden. It looks wonderful!!! Love what you are doing here! I’ve nominated you for the One Lovely Blogger Award. If you wish to accept, swing by the homestead (oceannah) for details. You are doing good work…the more we all can get kids reconnected to the land, the better their future and ours. Thank you. One of my favorite quotes: Many small people in many small places doing many small things will change the face of the world. We’re doing our little bit here, and it looks like you’re doing your own good work there! Great blog. It’s great to see other garden blogs and what’s happening in the garden in different schools. Thank you also for stumbling upon our own school garden blog. You’ll see I left a comment on your page! I agree that it’s incredibly helpful to connect with other school gardens, as each program is unique and we stand to learn a lot from each other! Inspiring… encouraging…challenges me. I expect nothing less than amazing from you Trish. I am never disappointed!! Thanks for your enthusiasm! I’m grateful for this little avenue to share ideas and passions, and I’m so glad you’re in on the conversation! Great Job Tricia… I can’t wait to read more!